You are here: Home / Blog / Blog / What Is Helping Me the Most in My Parkinson’s Battle? What Is Helping Me the Most in My Parkinson’s Battle? I am slowly coming to realize that each diagnosis of Parkinson’s disease (PD) is unique. PD patients suffer different symptoms and different rates of disease progression. Some remedies work for some, and not for others. In many cases, those of us with PD are left to our own devices. Doctors can only suggest options for us. As for medications, in the end, we must listen to our bodies very carefully to determine what will and what won’t work. The ultimate goal is to find the right “cocktail” of drugs so that PD symptoms are masked and there are few or manageable side effects. Sadly, my experience has been that changes in medications and dosages have not given me aha! moments where I can see a significant reduction in symptoms. If there are any improvements, they are extremely subtle. Many of my fellow PD sufferers have shared their struggles with the appearance of a possible new symptom or worsening of existing symptoms. Is it something we ate? Or do we chalk it up to a bad PD day? Could it be fluctuations in barometric pressure or is it part of the normal aging process? Is our disease progressing or have we taken our medications at the wrong times? Should we have eaten more food or had more water with our pills? Did we get enough sleep or are we too stressed? The list goes on and on. With PD, there is so much uncertainty. It is very difficult to determine what is helping my symptoms or slowing the disease progression, and what is not. What do I think has helped me the most? I leave no stone unturned in my efforts to combat this disease, especially when it comes to exercise and movement alternatives. In September 2017, I started Rock Steady Boxing twice a week. Boxing has been one of the most effective tools in my arsenal for fighting PD. It has given me the confidence to feel like the athlete I once was. 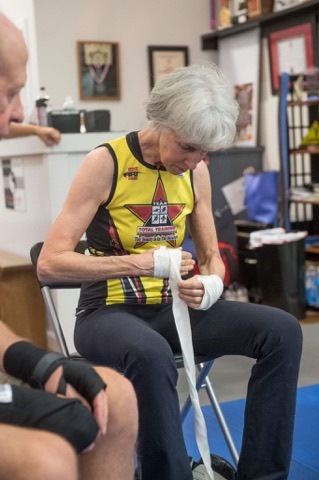 Boxing helps me improve my stamina, speed, and strength, and the participants (everyone in the class has PD) offer great support and camaraderie. As I set out on my one-hour commute to Rock Steady Boxing class twice a week and put on my hand wraps and gloves, I truly feel like a warrior getting ready for battle. A formula for one PD patient may not work for another PD patient, and the plan must continuously be tweaked. As difficult as it is, we must reduce our stress levels. I believe both good and bad stress exacerbate our symptoms. In a future column, I will share some of my experiences with the Rock Steady Boxing classes. The post What Is Helping Me the Most in My Parkinson’s Battle? appeared first on Parkinson’s News Today. http://www.parkinsonalabama.com/wp-content/uploads/2018/08/shutterstock_672426556.jpg 627 1000 AMP http://www.parkinsonalabama.com/wp-content/uploads/2014/09/PAA-logo-sized.png AMP2018-08-07 09:03:002018-10-09 13:20:14What Is Helping Me the Most in My Parkinson’s Battle?